A-HOTEL.com - Luxury and cheap accommodation in Serdobol', Russia. Prices and hotel, apartment booking in Serdobol' and surrounding. Providing free WiFi, Hostel Stars is set in Sortavala. All rooms boast a kitchenette and a shared bathroom. Offering free WiFi and lake views, Euro Studio on Komsomolskaya 8 is an accommodation situated in Sortavala. The property features city views. 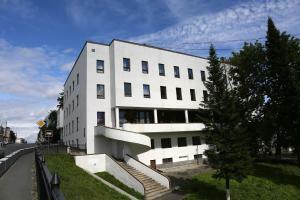 Studio-Apartment on Chkalova is set in Sortavala. This apartment features accommodation with free WiFi. Located in multiple locations throughout Sortavala, Uyutnyy Dom features a number of different apartments with free Wi-Fi access. The apartments offer guests a microwave, an electric kettle, a dining area, a TV with cable channels, and a bathroom with a shower. Dacha Hostel is situated in Sortavala. The accommodation features a 24-hour front desk and a shared kitchen for guests.